Landfills are generally useless, smelly eyesores. But many towns are finding new, profitable uses for the piles of junk that dot America’s landscape. Hickory Ridge Landfill outside Atlanta is the world’s largest solar cap. It produces 1 megawatt of electricity from its panels—enough to offset the total energy the landfill uses, or to power 225 homes. More than 7,000 photovoltaic panels dot 10 acres of the outside of the domed landfill’s membrane. Republic Services, one of the biggest waste-management services in the U.S., owns and operates Hickory Ridge and sells the energy collected to Atlanta’s power company. San Antonio was the home of the first landfill in the country to be covered by solar panels. In 2008, HDR worked with Republic Services to develop the flexible solar technology needed to utilize the curve of the land to collect sun while being able to move as the land settled over the years. Generally, these properties cannot be developed for general commercial or residential purposes and may not provide adequate revenue to the towns and counties where they are situated,” said John Reinert, director of communications for the New Jersey Board of Public Utilities. 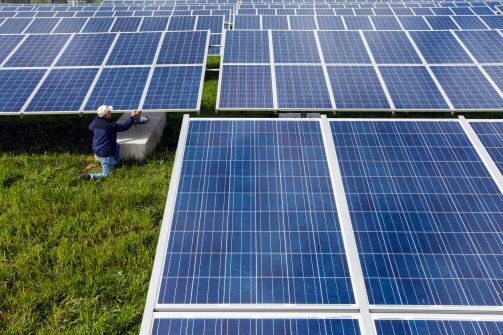 Massachusetts has also jumped on the solar bandwagon—in the last two years it has installed 39 solar panels on landfills; combined, they comprise about 78 megawatts of capacity. For example, an 11-acre landfill site in Easthampton, Massachusetts, now hosts a 9,620-panel, 2.2-megawatt solar plant. More information on the state’s capped landfill facilities can be seen here. The state has a goal of placing 100 megawatts of clean energy—a combination of solar and wind—on closed landfills by 2020. In addition to its 39 solar-paneled landfills, two capped landfills in Massachusetts are covered by wind turbines. New Jersey has seven solar-voltaic landfills with a combined capacity of more than 17 megawatts. Although there doesn’t seem to be any comprehensive national numbers on the amount of capped landfills producing solar energy, a 2013 report by the Environmental Protection Agency on landfill use for solar panels references15 landfills in areas from Sarasota, Florida, to Fort Collins, Colorado, that are adopting the technology. And more are popping up every day. Last week, Brookfield, Massachusetts, announced that Washington Gas Energy Systems will develop a solar plant on a capped landfill to supply the town’s power needs.